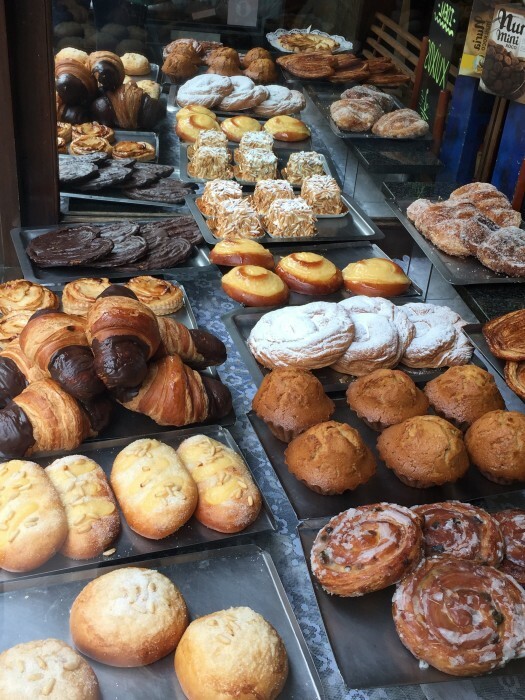 On my first full day in Spain, I woke up early to go on a cultural journey with Devour Barcelona Food Tours. Even under the fog of jet lag, I was excited and curious. Our tour guide and motley crew of foodies. 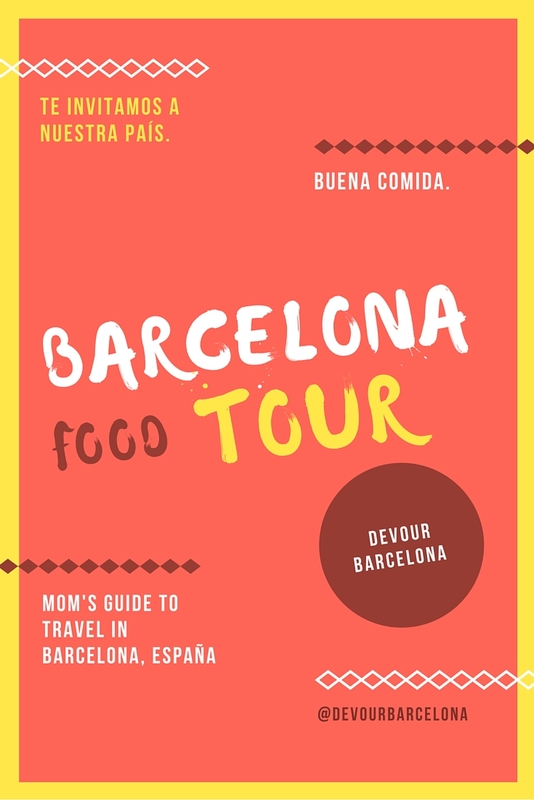 At the end of the day, Barcelona Food Tours was consistent with my past experiences. 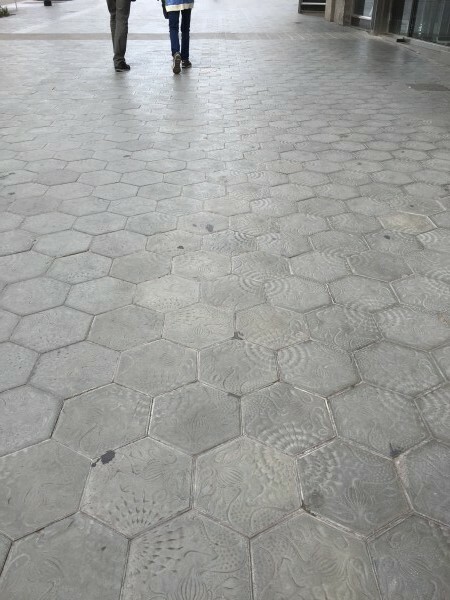 Gaudi tiles on Passeig de Gracia under our feet. 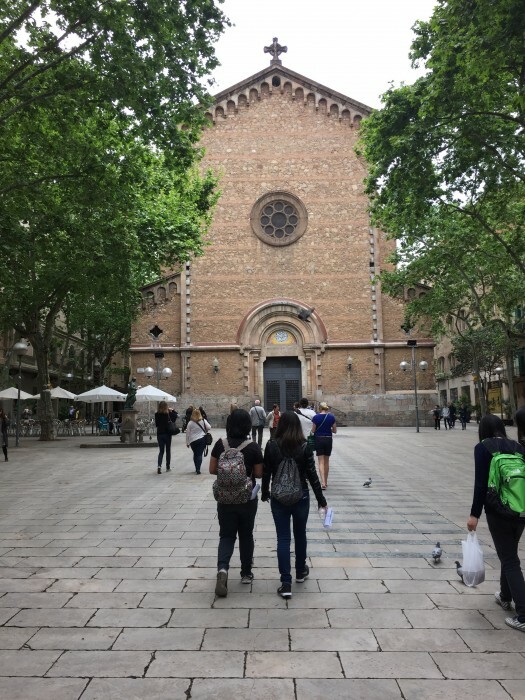 The 10 a.m. tour began on Passeig de Gracia, a main shopping thoroughfare, and equivalent to Manhattan’s 5th Avenue. With Gaudi-designed tiles under our feet, the tour guide, an expat from San Francisco, provided context to where we were standing and gave us the run down of where we’d be touring for the day. If you’re not an early riser, don’t worry. Let the expectation of cava at 10am and good food be your motivation. The quiet and intimate Gràcia neighborhood is just a stone’s throw from the more bustling areas of Barcelona. For centuries, this relaxed neighborhood used to sit on the outskirts of the city as an independent village. In 1897 it was annexed to Barcelona, expanding the city’s northern boundaries. Not your grandma’s Gin and tonic. According to our guide, in the 1980s and 90s, it became a Gypsy hangout. 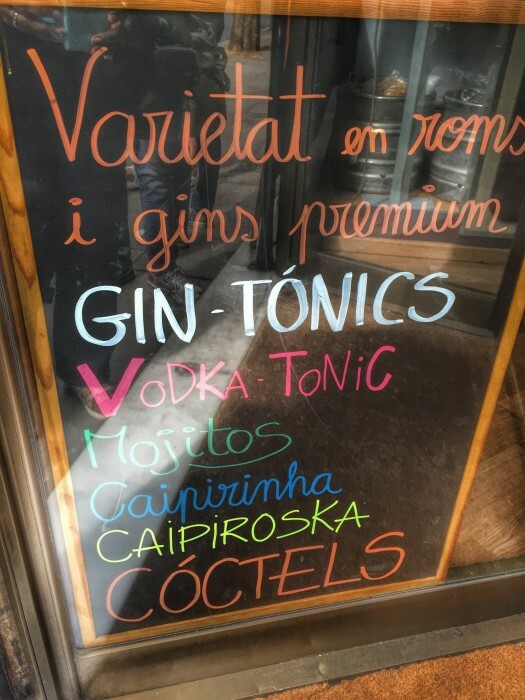 Today it is popular for its small mom and pop shops, as well as its contribution to the gin and tonic revival. Did someone say cava at 10 am in the morning? Yup! This small eatery is owned by sisters Inma and Rosa Tosca. 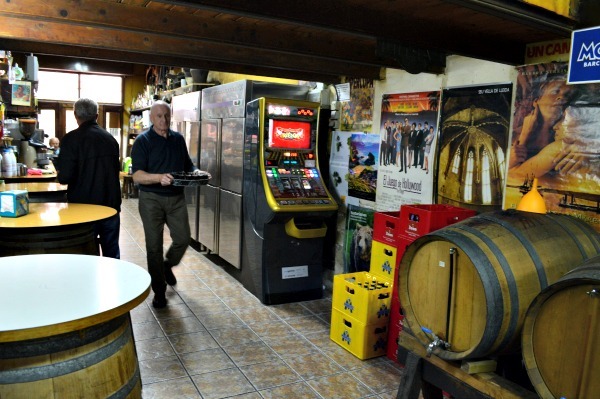 The bar/restaurant has been in their family since 1961. 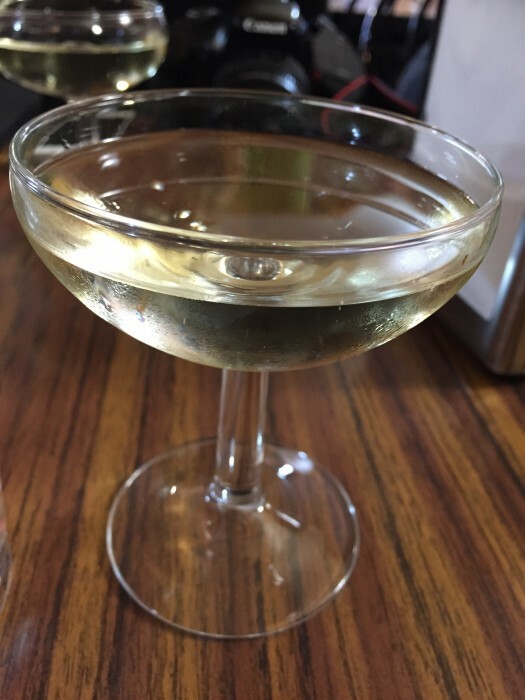 The Tosca’s hospitality started our stomachs (and expectations) off right with a glass of cava. Yes, it was only 10:30 am in Spain but my body recognized that it was 4:30am back home – perfectly acceptable time to drink! 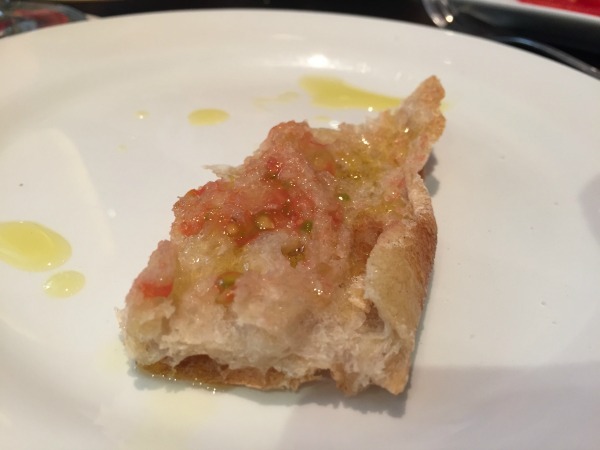 At Can Tosca, we were introduced to pan e tomate (bread and tomato), a typical part of the Catalan morning. Fresh baguettes toasted and laced with fresh raw garlic then ripe Roma tomatoes were topped with either sausage or in my case a garlic and herb type of omelette. Funny enough I’d just said to my girlfriend the previous day that I was craving an omelette and hoped I’d get one while in Barcelona – this restaurant over-delivered on that score. A typical market day for the locals. 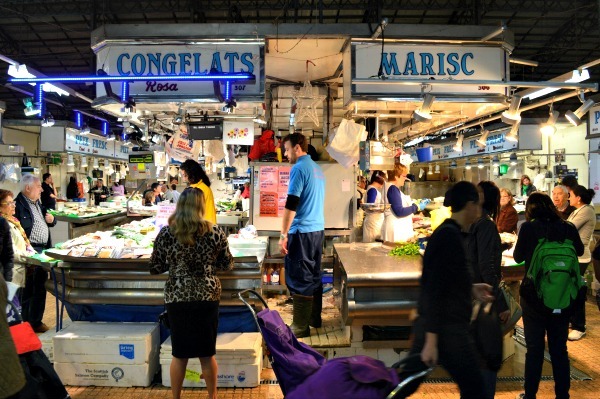 Our second stop brought us to Mercat de l’Abaceria Central, a small local food market void of tourists. According to the locals, the best days to visit any of these markets is on a Tuesday or Wednesday, when items are freshly stocked for the week ahead. 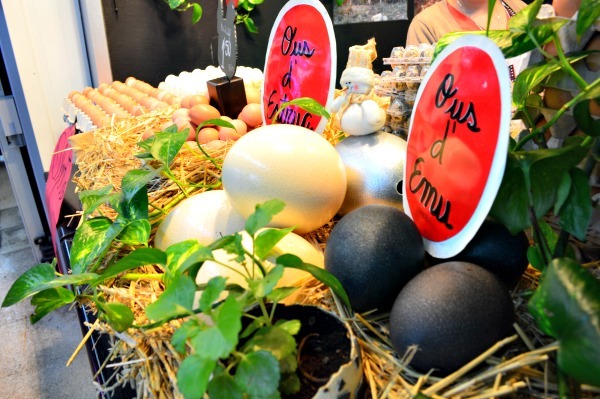 Eggs at market – beautiful but not as common. 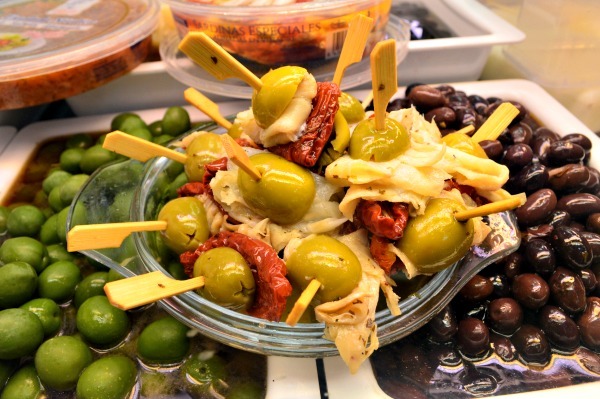 Most stands at l’Abaceria specialize in one main food whether it’s olives, eggs, meats, cheese, pastry. You’re almost guaranteed to get the best of the best. Unfortunately in America we opt for convenience. Verrrrrry interesting looking crabs and a very angry dead fish. Local food markets are fun. You see all sorts of meats, fish, ingredients and dishes that you may not ordinarily see in supermarkets. At the stand of Conserves Glória we eyed rows of Spanish olives. One of the exciting characteristics of a food tour is being exposed to food combinations you may not independently try. This olive and salt cod skewer is not something that Worldtravelmom would’ve reached for in a Barcelona buffet, however, I made a vow to try anything as long as it wasn’t red meat or pork. The skewer turned out to be a slightly salty and flavorful combination. It was a surprisingly refreshing amuse-bouche. 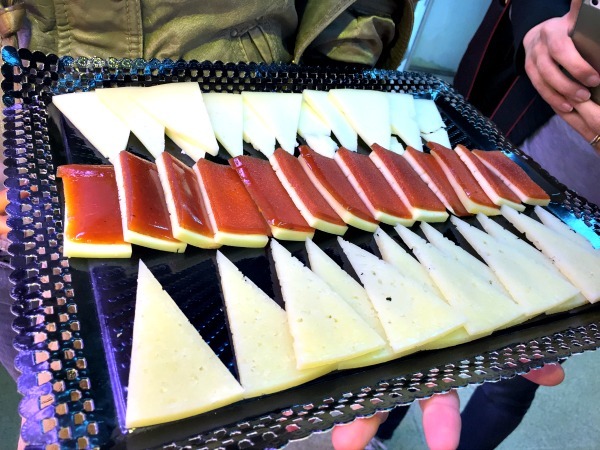 The second stand that we visited was La Trobada del Gourmet, a stand which specialized in and offered a selection of Spanish and Catalan cheeses. We sampled three of the cheeses there, including Urgelia topped with quince fruit, a balancing combination of salty and sweet. Three phenomenal cheeses – only thing msissing was the wine. The smoked cheese, Idiazabal was probably my favorite with the drier Manxec coming in third place. 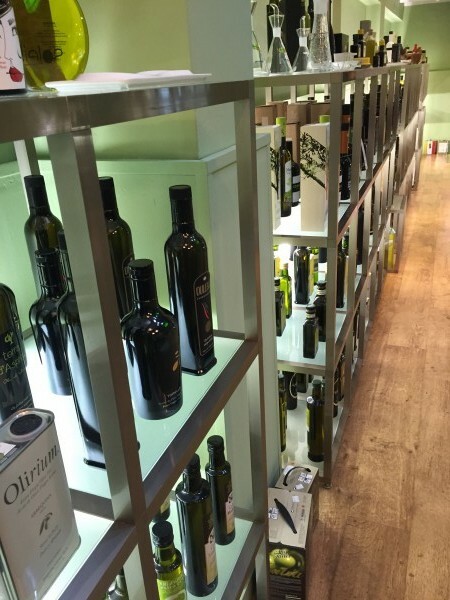 The fifth stop of our tour landed us at a boutique olive shop, complete with a back-of-the-house tasting room. 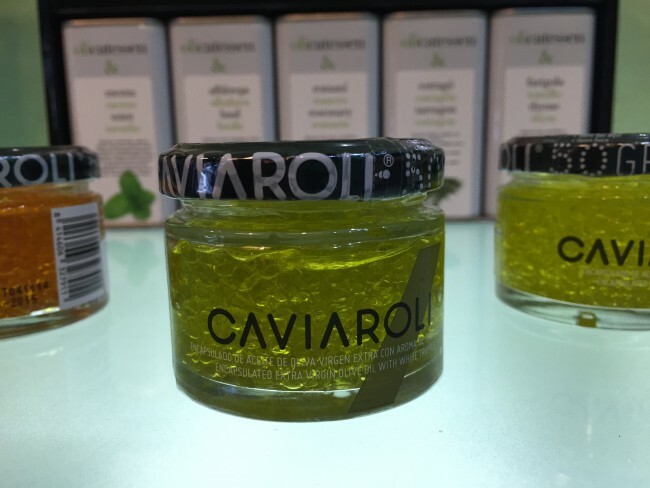 Olive oil made to look like caviar – a few of the unique items you’ll find. 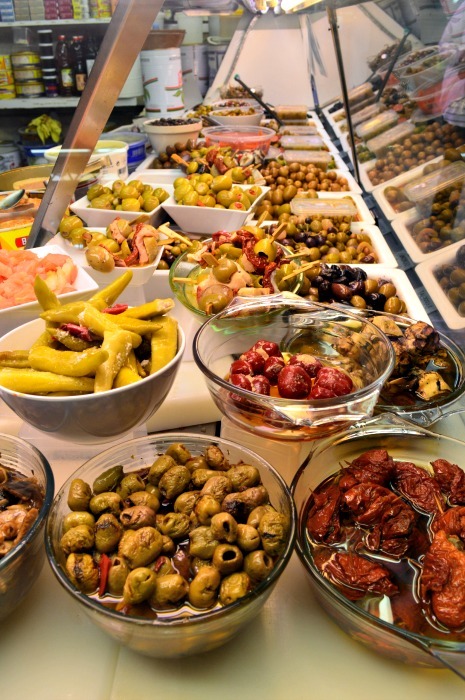 Spain is the largest olive oil producing country in the world, with Italy following in second and Greece in third. Care to taste the earth? Try this intense olive oil. Much like a wine or coffee tasting, it’s appropriate to make audible sucking noises in order to aerate the oil and get the flavors circulating through your mouth and nostrils. 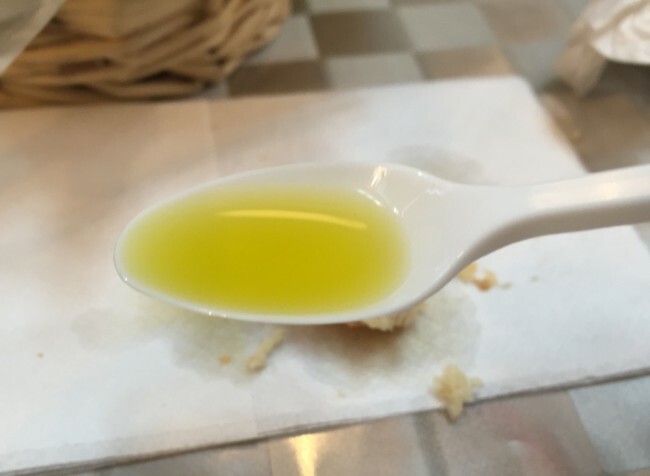 We novices chose to either dip our pinches of bread or sip the oils gingerly from our spoons. Tasting the olive oil straight-up, no bread, no chaser. 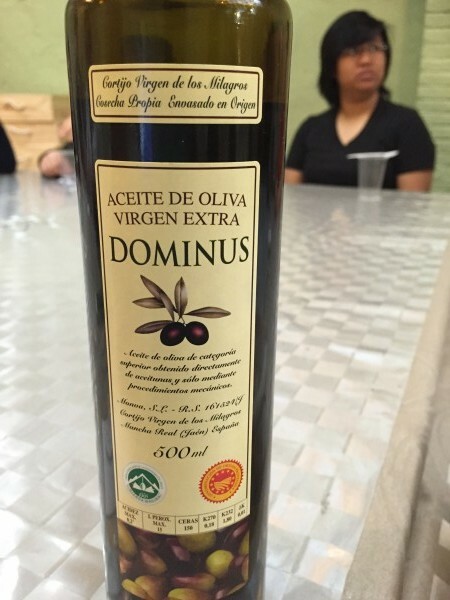 You quickly learn that you know very little about quality extra virgin olive oil until you’ve gone to a proper tasting. Trust me when I say that along with various notes of spices and herbs, I could taste the soil in these oils. 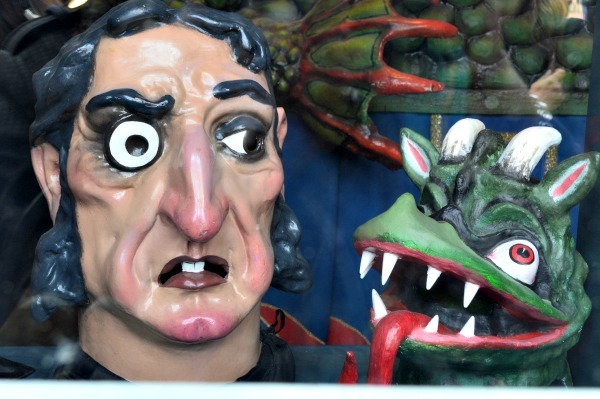 On the way to our next tasting, we stopped at Placa Rius i Taulet where we peered into a building that housed the costumes and characters of the neighborhood’s annual festival. 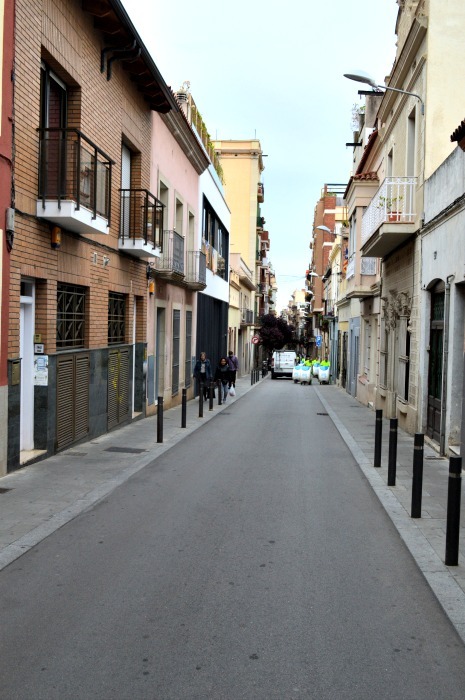 The quiet, clean, and narrow streets of Gracia. We continued to stroll through near-empty narrow streets unfit for trucks or parking. You won’t find as many tourists in Gràcia, a detail that helps it maintain much of its village charm. At l’Anxoveta we made our own pa amb tomàquet (bread and tomato) while enjoying a glass of Penedès wine. Bread and tomato – this makes me so hungry. This appetizer was followed by a “bomba” (potato and ground beef croquette with brava sauce) for the red-meat eaters. 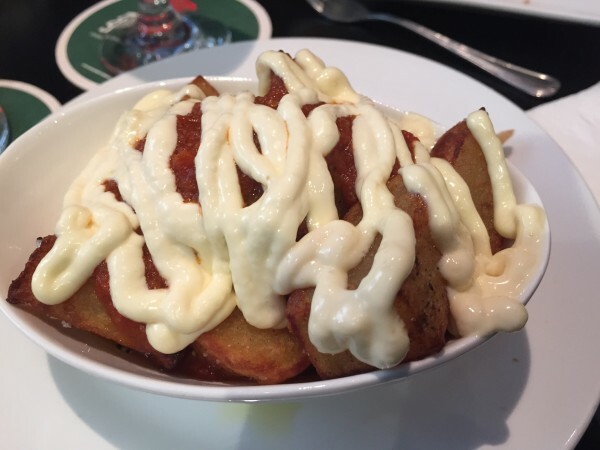 I enjoyed a healthy dish of potatas bravas which was spicy and filling. 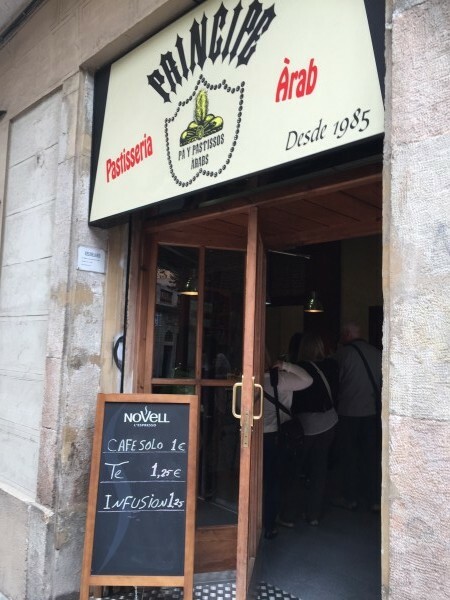 The owner explained the origins of pa amb tomàquet to us in Catalòn as he sliced through crispy french bread, providing us with a demonstration before leaving us to our own devices. In between sips of beer and wine, we made our own tomato and bread with the understanding that it wouldn’t taste quite the same upon duplicating at home. 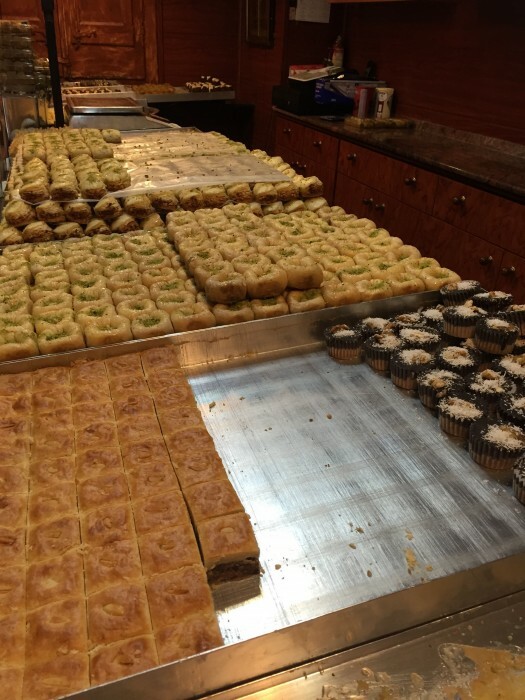 Not far from Placa del Sol sits Pastisseria Principe, where you will find an array of sweet handmade Syrian pastry. This was one of several stops where I appreciated the benefit of being on a food tour. 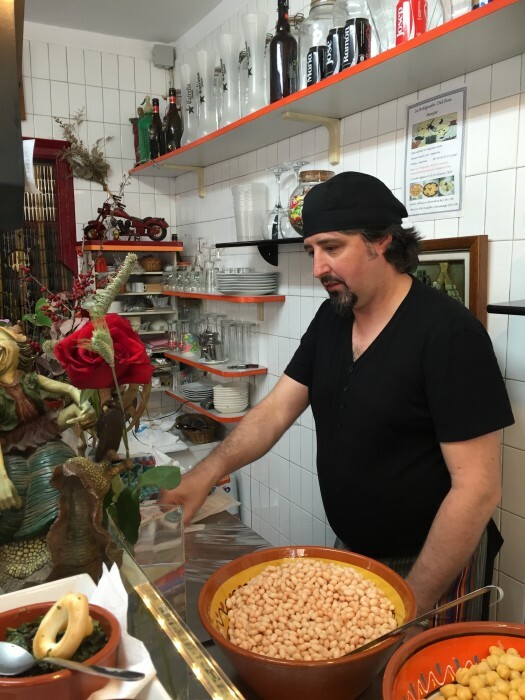 Our guide shared the story behind the owner, a Syrian gentleman who had traveled to Spain in the early 80’s, fell in love, married within two months of his arrival, and shortly thereafter opened a sweets shop. 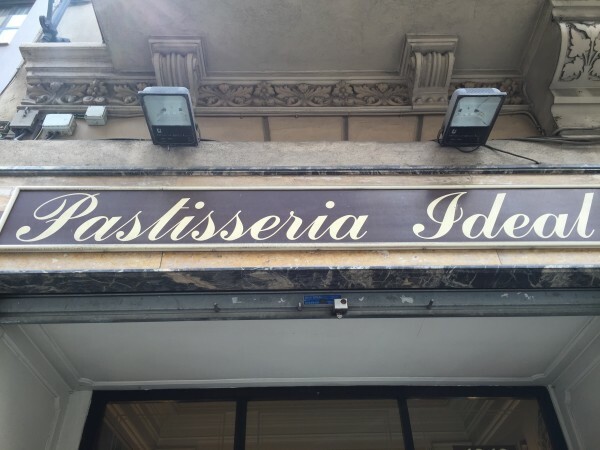 Only on a food tour would you learn the story behind a place like Pastisseria Principe. 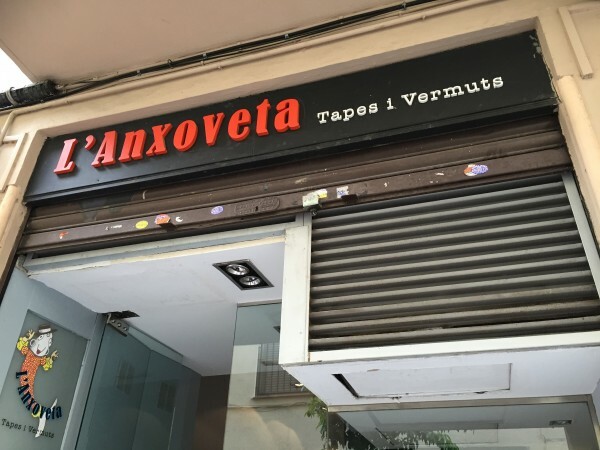 The shop is representative of the diversity that you’ll find in Barcelona. 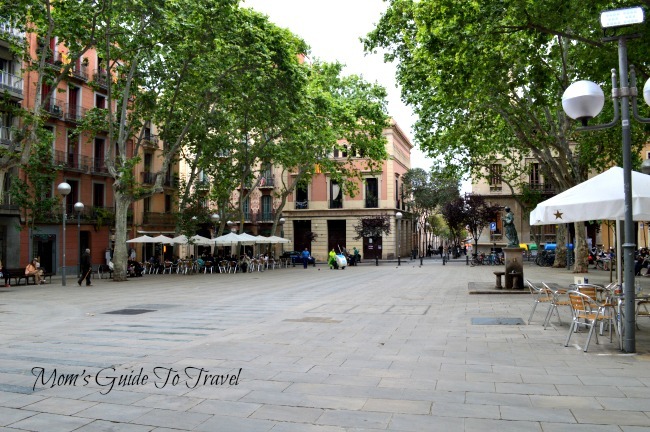 Five minutes away, we walked through yet another one of Gràcia’s small plazas, Placa Virreina. Tranquil and still, it felt as if the few dozens of people sitting down for a cafè were all on vacation or a lazy lunch break. 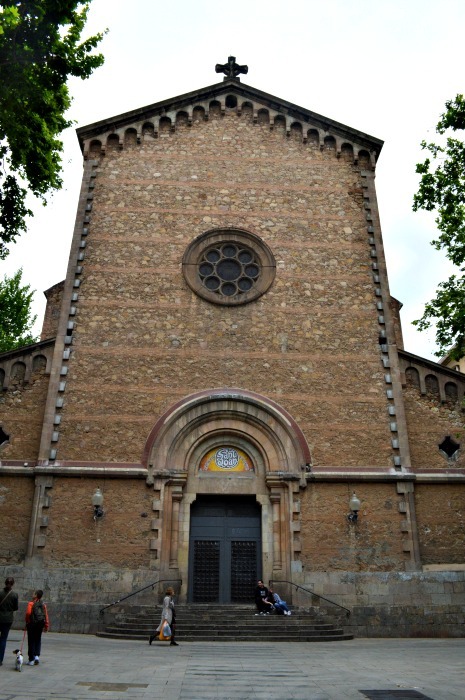 The church of Sant Joan anchors the Placa Virreina with is weathered face and its black iron doors. A bodega I would’ve never thought to enter. Looking much like what we’d call a dive bar in the city, this eatery was rustic and simple. The barrels where the local Perruchi red vermouth are aged sat against the walls, feet away from our wooden tables. This vermouth isn’t what we Americans associate with classic vermouth which we use to make Martinis. 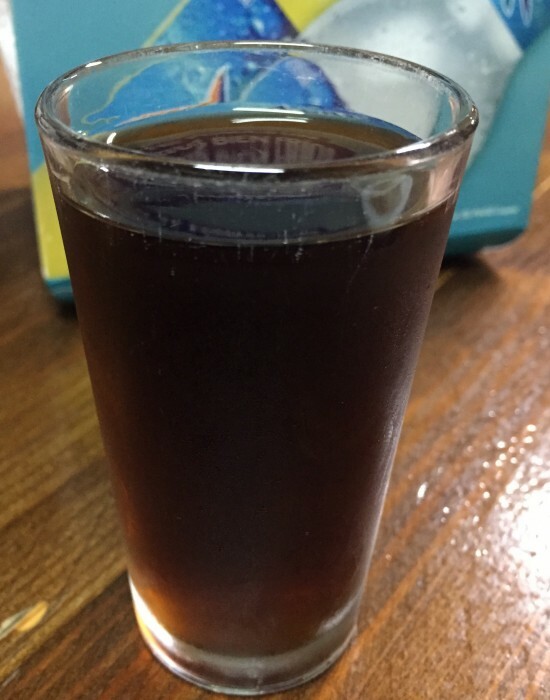 This Catalon vermouth tasted like a mix of wine and herbs. This vermouth was more like a wine. 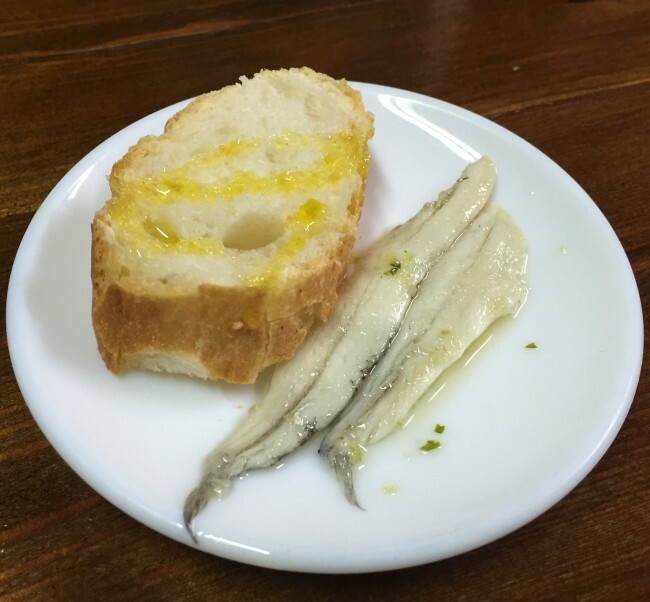 Fuet and pickled anchovies accompanied our vermouth, drawing up images for me of older Spanish men sitting table-side, smoking in a plaza, talking loudly of politics and war. The primary sign above the door reads Llegums Cuites Isabel but the name of this shop is La Botigueta del Bon Menjar. The owner reminded me of a flamenco dancer I saw on a poster in Lloret de Mar. La Botigueta specializes in bean-based dishes and was designed for women who wanted to grab a quick homemade meal when they were too busy or not in the mood to cook for the evening. First we tried a tasty spoonful of escalivada and romesco “pintxo”. The romesco sauce is a fantastic mix of ground hazelnuts, almonds, pepper, vinegar, garlic, and olive oil coupled with eggplant, roasted red pepper and an olive for garnishment. I don’t normally opt for savory dishes with ground nuts in them but escalivada was superb. It was packed with protein and rich flavors. Homemade meatballs in a bean and pea gravy. For our second dish, while the majority of the group devoured small plates of homemade meatballs in a bean and pea gravy, I enjoyed a delightfully light spinach dish with chickpeas. If I wore buttoned jeans on this tour, they would have been undone by now. Just in time, we wobbled our way into Pastisseria Ideal for a coffee and our final treat, a mini cremat. The pastry was creamy and sweet, reminiscent of dense vanilla pudding on angel food cake. 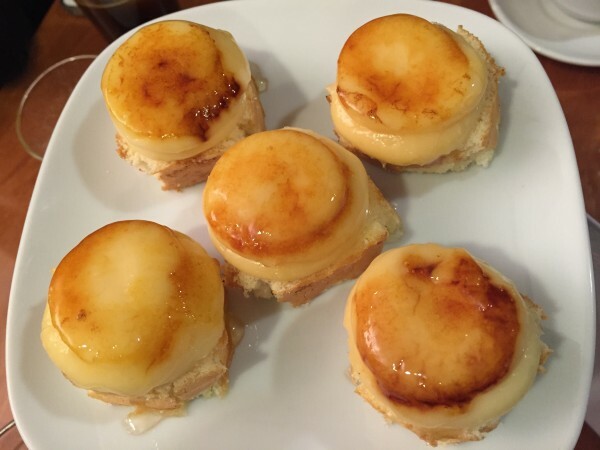 Mini cremat at Pastisseria Ideal – a sweet end to a yummy day. 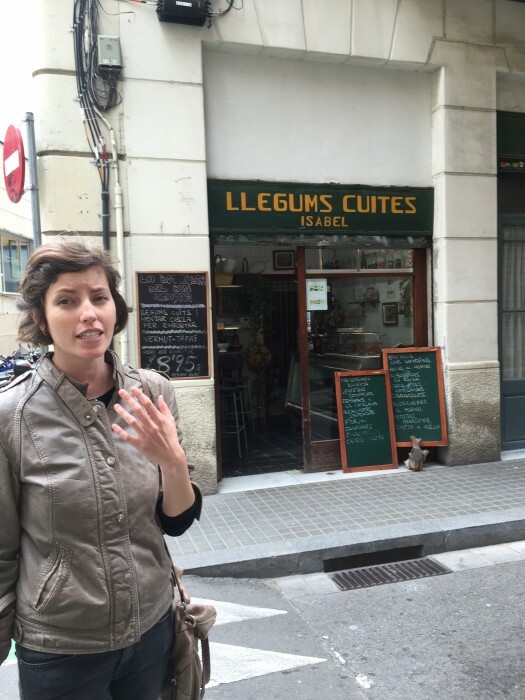 This last stop was literally the icing on an amazing food tour that provided a tasty glimpse into Catalan cuisine. Next time, this is where I want to start my food tour. 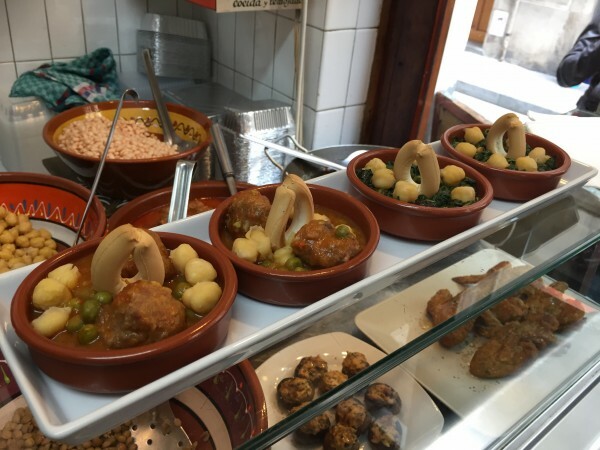 If you’d like a gentle introduction to Catalan cuisine, I’d recommend booking a spot on Devour Barcelona Food Tour. At €65, it’s a great value for the money. And as you can see, it can easily be your breakfast, lunch, and dinner for the day. Special Note for Families: guides will try to make an extra stop to a sweets shop for the kids’ enjoyment. In addition, children under 12 are half-priced. 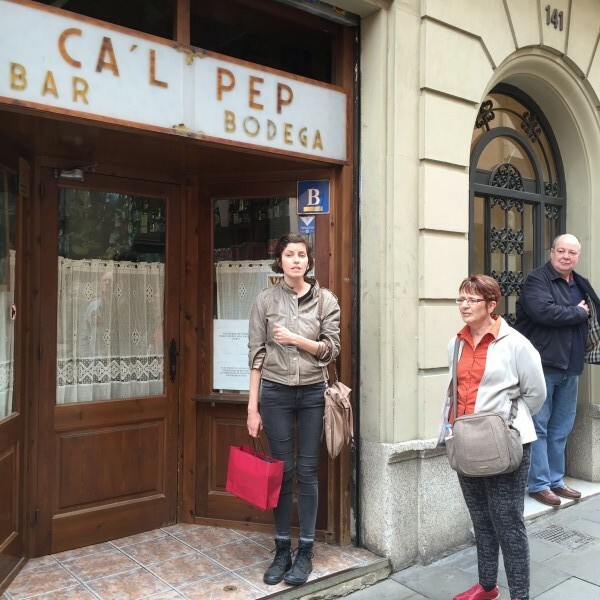 Thanks to Barcelona Food Tours for inviting me on this journey into the foods and culture of the Catalan region. Hi Tawanna! 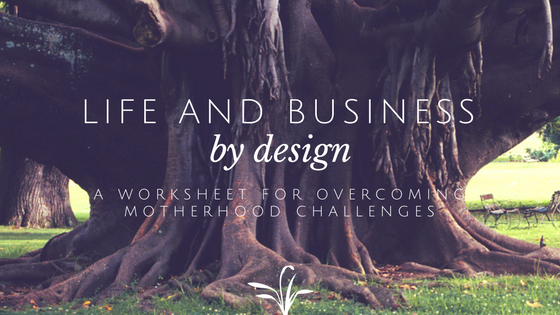 Thanks so much for this lovely post! I’m so glad you enjoyed the tour, and hope you had an awesome rest of your time in Barcelona and Catalonia!! Thanks Renee! The tour set the tone for the wonderful food and people I met in the area. Really enjoyed reading your blog. I’ll definately be adding this to my to do list in August. Cooper, definitely put it on your list! 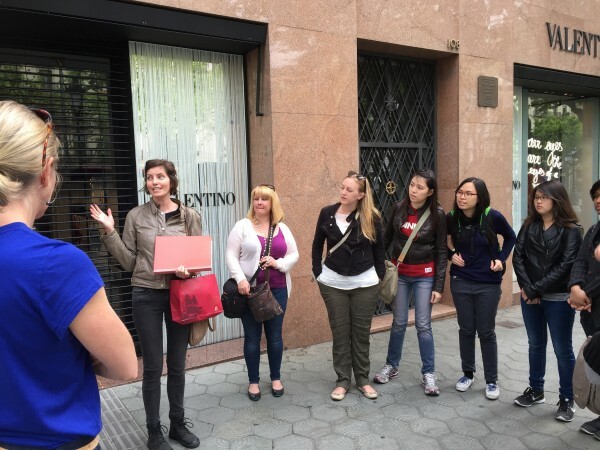 It really is a good way to kill 2 birds with one stone – see a different neighborhood in the city with a local expert AND eat some yummy food. I was there, and I still felt like I was eating every bite along with you reading this post! Thank you Anne for stopping by! Yes, I am totally re-living the moment as well. Spain looks amazing! I am not sure I would eat all that food but I am sure I would try a lot of it. The drinks for sure!!! Well, the saving grace Charles was that we were walking for a good 5 hours in between all of these places. The best strategy is to try everything but just eat what you love! I think I’ll remember that for my next food tour (but I do try not to be wasteful). Hi Betsy, I agree. I love the “old” way of shopping, going to specialist stores instead of supermarkets. It’s one of the first characteristics of Florence that made me fall in love with that city 20 years ago when I lived there for 6 months as a teenager. So much is changing around the world unfortunately in this respect. Nice to see a place like Gràcia still thriving even without those conglomerates. Hi Victoria, it was great meeting you also. The tour convinced me that every time I visit a new city abroad, I should start my trip off with a food tour. This way I know what’s traditional (and good), get a glimpse of the culture and history, and work off the calories the rest of my time there! 😉 See ya soon. Stop it!!! Now I want all that food right now! Such cute photos, too. 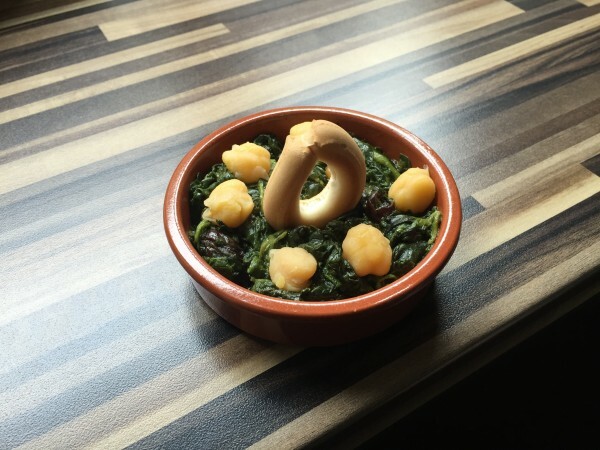 I love how the spinach is arranged. Thanks Lillie. I try not to read this post every day because all it does is make me hungry too. I really enjoyed reading this blog, your added insight was very informative and the pictures of all the delicious quinines were such a tease . You managed to truly capture the culture as well through the camera lens and we look forward to adding such a tour on our European to do list. Aww, I appreciate the complement Sabian. Hope you get to that list soon. I put Spain off for much longer than I should have. Looking forward to going back. Thanks for stopping by. Well done and spoke to all the pleasantries of the area! Thank you so much for joining our tour Tawanna! 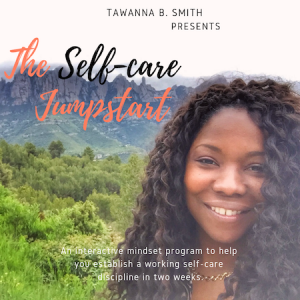 This is such a beautiful post about your experience! Glad we were able to get it on the schedule at the last minute! Hey Leon! Thanks so much for stopping by and reading. How fun to have been there as a teenager. I stayed in Lloret for several days before heading to Barcelona. I also want to return and I just got back! It’s probably changed quite a bit since you were last there so I’d say it’s time for your return. That;s really great that the tour has a discount for kids, though I have a hard time imagining they could hold up that long. 65 euros sounds like a great deal. I’d do it! Yeah, it’s a really great value Penny. Straight from owner Lauren Aloise’s keyboard: “We’ve had 7 year olds love it, and teens too. But generally they were good natured kids who were adventurous eaters. As Barcelona’s tour does include a lot of walking, we do warn parents to think twice. But in the end the kids who do come seem to have lots of fun. 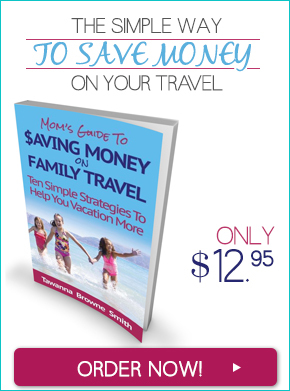 Our tours in Madrid and Seville also have kid’s prices and are a bit less walking.” Thought this was good FYI. 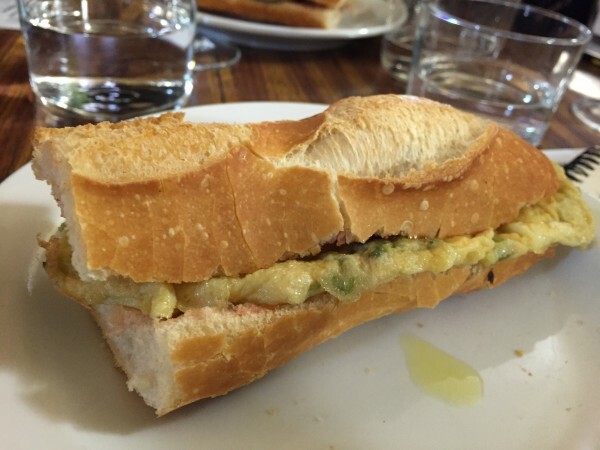 Thanks for sharing your Devour Barcelona Food Tour. Your food photos make me hungry and remind me of the delicious food (and Cava!) in Spain. 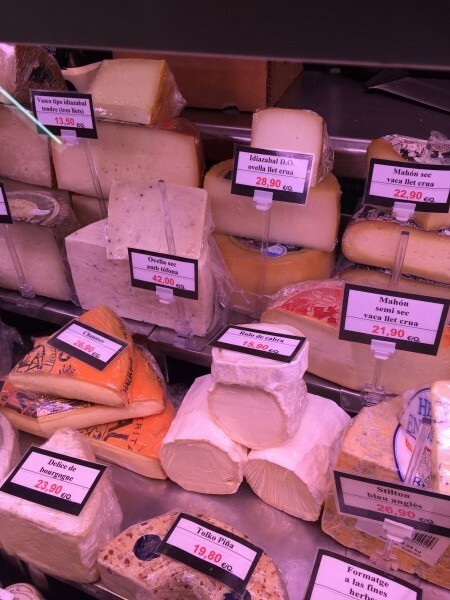 I love visiting food markets in European cities. 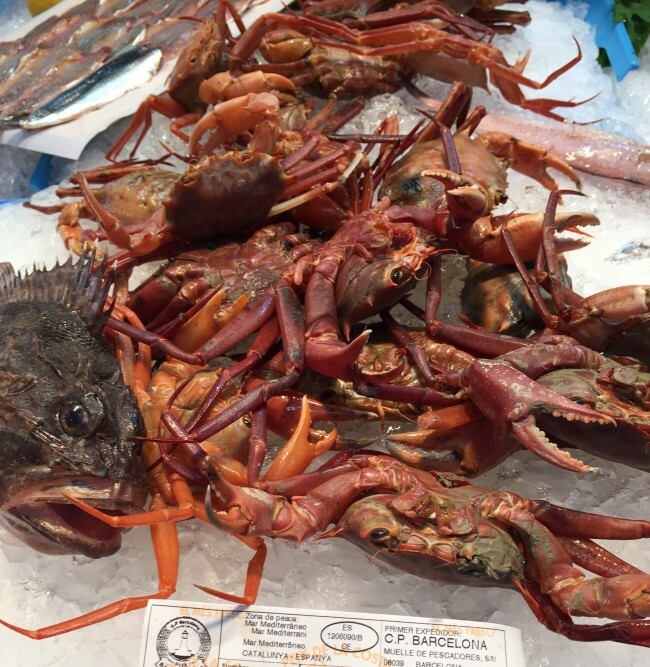 but this Devour Barcelona tour also took you to places I would never have tried on my own. A good recommendation for a foodie intro to the city! Exactly Larissa! I would’ve never visited some of these places or eaten half of these foods. I was recently in London and overheard a few people talking about vacationing in Barcelona, and I thought “Hmmm, that sounds really nice.” Then I read your post, and Barcelona has now jumped to the top of my list for next vacation.